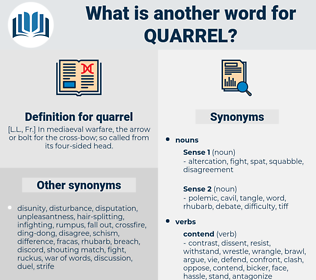 What is another word for quarrel? [ L. L., Fr.] In mediaeval warfare, the arrow or bolt for the cross-bow; so called from its four-sided head. argument, feud, controversy, Squabbling, wrangling, conflict, bickering, battle, struggle, fight, discrepancy, clash, Quarrelling, litigation. concord, order, approval, agreement, peace, quiet, calm, sanction, accord, calmness, concurrence, harmony, praise, tranquility. give in, concur, retreat, agree, keep, harmonize, surrender, ignore, approve, give up, endorse, make peace, yield. I had a quarrel with them both this morning and I said I should tell you.
" What is the matter, Augusta," she had said, " that you are determined to quarrel with me?"